Finding a reputable waterproof deck installer is as important, if not more, than having a deck. Plenty of reports have filtered through to the ears of the public to want to cringe at the stories about deck failures. The underlying lesson is one of selecting the right person who is not just qualified but experienced. It is an unavoidable but important task and the homeowner needs to equip themselves with the right tools to make sure they have the right contractor. Deck failures can prove highly dangerous. They occur for several reasons — some surprising. Most deal with the construction methods and the failure of foresight. Others arrive overtime because of failure to take preventative measure to assure a deck’s long-term longevity. A recent deck failure underscores the issues of preventative measures and failure of foresight. Though not fully determined as of this moment, the second story deck collapsed causing injury to more than a dozen people. Attached to the second story of a historical home, the deck posed a dangerous risk if it failed. Some blame the disastrous event on overload — too many people were on the deck. Initial investigations uncovered that poor maintenance and the failure to waterproof were the cause. With this example framing the issue that homeowners can visualize, questions naturally should surface. 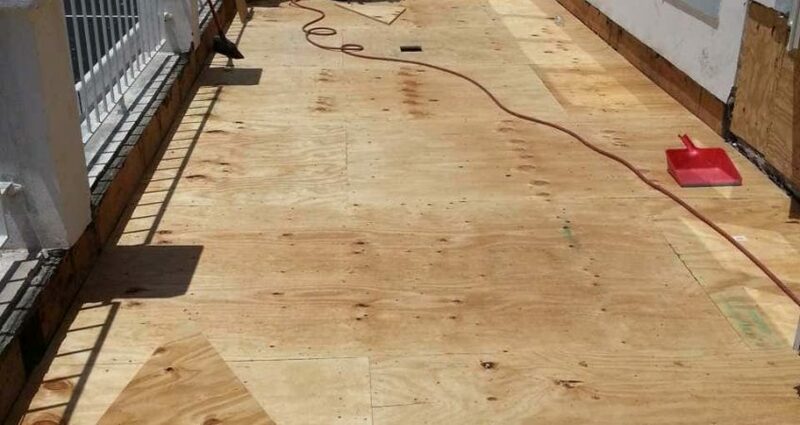 Consider your region and the deck’s material and design to frame the first questions, aside from making sure the contractor has a license and can provide examples and references for prior deck jobs. If they can’t provide the requested proof of their qualifications and experience, then move on. Don’t ever fear making contact with these people. Call the one that has the oldest deck first. That is a guarantee of what to expect in the future. Next, ask about the deck design and the materials. Ask if they wouldn’t mind if they would be upset if you should their plans to another contractor. You may not, but the answer may prove telling. Failure to reveal plans to other qualified individuals suggest something is wrong. Plans designs are pretty well-known in the industry and unless you have a design that is a big departure from the norm, then using an engineer to check the plans might prove smart. Checking on the contractor might entail making inquiries at the permit office. You might even inquire about the local ordinances and permits required before hiring a contractor. Your city or town can provide interesting results. They can also suggest waterproofing requirements for varying materials. As the above examples shows, waterproofing as a maintenance step is important. Like wood or cement or a composite, waterproofing is an essential part of deck construction. Asking about and how the contractor plans to employ a design that takes the fullest advantage of the protective care waterproofing has to offer reveals much. If a design militates against waterproofing given the challenges to its specific location, then you know there is a problem. When you are at the local permit office in your town or city, ask about plans for decks that meet city codes. Most cities provide such information that show how far apart floor joist must be given a certain span, what the lip requirement is around the deck’s frame, how high it must rise above the ground, the requirements for railings and more. Compare them to the plans provided by the perspective contractor. Deck failures, or short-lived decks, often obtain that status for reasons stated above. Poor construction as a result of not following codes, poor or improper maintenance that can result from designs that militate against waterproofing, and the lack of foresight. This latter point is especially important for second and above-story decking. The homeowner needs notice and recommendations to improve deck integrity in some cases. Contact us, Pli-Dek Systems, to learn about waterproofing’s important role in the construction of decks and to obtain contact information of Pli-Dek Certified Installers.